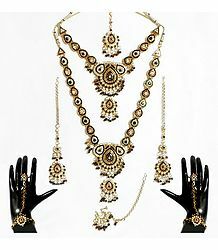 Jewelry has been an integral part of Indian culture since time immemorial. Jewelry has always been used as adornment by both Indian men and women. It is customary, especially for every Indian woman, to wear some pieces of ornaments on an everyday basis - in fact, it is considered auspicious in many parts of India for women to wear earrings, bangles, anklets, toe rings, nose rings and so on. 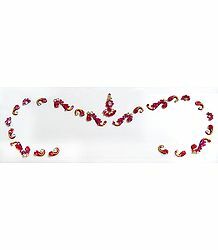 On festival and special occasions, Indian girls and women of all ages, castes, classes and creeds adorn themselves with heavy jewelry; made from varied material; covering a very vast price range as well. 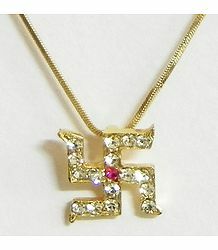 People in India also gift others jewelry on special occasions. Even today, jewelry is considered not only as a means of ornamentation, but also as a sign of power, wealth and status. Ornaments, especially those made of gold and precious stones, are additionally considered as a source of financial security, which can come of great help in times of crisis. This is how the system of offering dowry emerged in the Indian society. The girl's 'Streedhan' or dowry would actually constitute her share of the property, which would be given to her in the form of heavy jewelry. Indian women are gifted ornaments during many special times and occasions in their lifetime. These include at their own birth, coming of age, marriage, on giving birth to a baby and so on. Certain items such as the mangalsutra, nose ring and toe rings exclusively proclaim the marital status of the woman. Indian jewelry design is as varied and diverse as the nation itself. Each piece of jewelry veritably has a story to tell about the state where it originates from and the patterns, the materials used, the artwork featuring in the items and the price range differs vastly from state to state. Gold is the most used metal in real jewelry. Several types of gemstones are incorporated into these pieces to make interesting patterns and designs. Diamonds are the most preferred gems among the uppermost classes of society. 1. 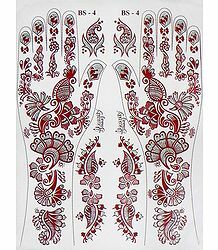 Mehndi or henna is applied on her hands and feet - this is a vital pre-wedding event. 2. The Shringar, where the bride is traditionally bedecked in a richly embroidered red saree. 3. She is then adorned with make-up, flowers and jewelry. 4. Her eyes are highlighted with thick kohl or Kajal. 5. The bindi or kumkum is placed on her forehead. 6. The maangtikka is placed on the central parting of her hair. This is usually made of gold and is embellished with precious or semi-precious stones. 7. A nath or nose ring makes her look further radiant. This nath is sometimes supported by a gold chain, which extends till just behind the ear. 8. Large earrings complete the traditional look. These are sometimes supported by a chain, which passes over the crown of the head. 9. She is then adorned with heavy necklaces of varying sizes, each containing a different pattern and different colored stones. 10. Armlets or baajubands are worn on the arms, over the saree blouse. 11. 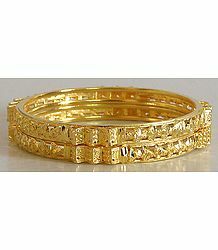 She is made to wear several bangles, made of different materials, such as glass, gold, diamonds and so on. 12. The kamarband is worn around the waist to further beautify and enhance her shape, while also holding her saree in place. 13. 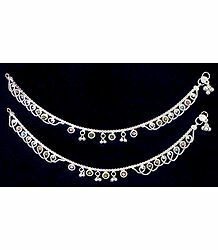 Silver or gold anklets are clipped on around her ankles and toe rings are slipped on as well. 14. Some brides wear a set of four finger rings, attached to a central piece of jewelry in floral design, connecting to a bracelet. This item covers the back of her palm. 15. A fragrance is applied on her to keep her smelling fresh. 16. Lastly and most importantly, sindoor or vermilion is applied on the parting of her hair during her wedding ceremony. Brides from different parts of India are bedecked differently. For instance, while south Indian brides are made to wear the talasaaman; an elaborate headgear, which spans across the hairline on the forehead and trying at the back; Bengali brides wear the mukut, a crown-shaped headgear made from sholapith. Brides from Kerala are usually ornamented in heavy gold jewelry, whereas Gujarati brides and others hailing from wealthy business communities are covered in ornaments made of gold, diamonds and other precious gemstones. The concept of Solah Singaar is undergoing a change today, with many brides preferring a minimalistic look. 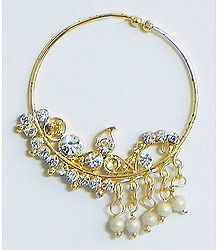 However, bridal jewelry still continues to constitute a style statement for Indian women from all over the world. In fact, wedding jewelry is today a thriving business, with suppliers offering a massive range of jewelry, spanning across a wide range of designs, patterns, metals, materials and price ranges. Let us now talk about the different types of jewelry used by women in India. Earrings come in a variety of shapes, sizes, types and materials. While these items are usually worn predominantly by women, there is a considerable population of males, especially urban males, who have taken a fancy to these. In the earlier days, earrings used to be worn by people belonging to both the sexes. While the most common location for piercing the ear is the earlobe, it is an increasing trend to pierce the ear in several other parts of the external ear - these are commonly referred to as â€œcartilage piercingsâ€. Earrings vastly vary in type and material used. They can be made from silver, gold, other metals such as bronze and copper; plastic, glass, pearls, enamel, Mother of Pearl, Lac, terracotta, beads, wood, camel bone, acrylic and even feathers. The more ethnic-looking Indian varieties are often studded with precious and semi-precious jewels. 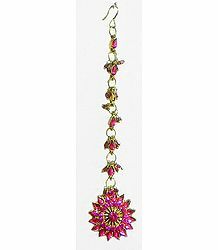 Earring designs range from small studs to hoops to large chandelier-type danglers. In India, most girls and in many traditions, many boys, get their ears pierced in a religious ceremony. In some families, infants' ears are pierced within a few weeks of their birth. This practice is also followed in several other Asian countries, including Sri Lanka, Nepal and Laos. In India, the family goldsmith usually pierces the child's ear during the ceremony. However, the gunshot technique of piercing the ear is now most popular due to its speed and minimal pain. Studs are small earrings, which are held by a clutch holding the main piece and its stem from the back. Stud earrings made of precious metals such as gold are usually secured with a small screw which winds itself in the stem of the earring. Hoop earrings are semi-circular in shape and are usually made of plastic or metal, with a thin wire penetrating the hole in the earlobe. Some hoop earrings, typically made of gold or silver, are circular in shape, with the ends connecting in the back. Danglers, as the name suggests, are designed to gracefully 'fall' from the earlobes. They come in varying lengths and weights; some long enough to brush the wearer's shoulders. 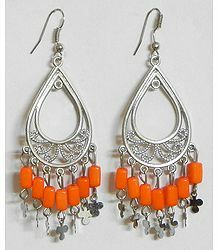 Huge danglers, which resemble intricately designed chandeliers, are often worn by women at parties. 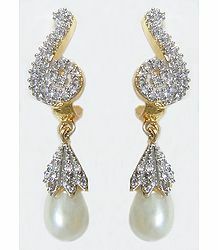 These look graceful while teamed with formal sarees or gowns. Ear cuffs are those that cover the entire part of the outer ear and are secured by a stem or hook attachment from behind, as in a regular earring. These are elaborate and look very elegant, especially for important occasions. 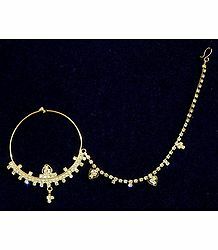 These items of jewelry are now coming back into vogue among women in certain parts of urban India. Ear Threads are thin chains that can easily enter the hole in the earlobe and come back out, to dangle elegantly from the ear. 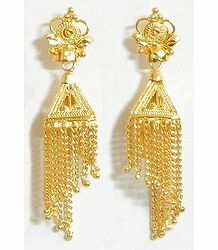 Some of these earrings have decorative beads hanging at one end, so as to make the set look even prettier. Flesh tunnels, also known as eyelets or Bullet Holes, are hollow in the middle. Usually made of rubber, they are inserted into the earlobe hole in order to expand its size. Clip-ons or non-pierced earrings just press onto the earlobe, without the wearing having to pierce the ear. Magnetic earrings, which are quite the rage among the younger generation, involve two pieces, one in front and one behind, which attach securely to each other, by means of a magnetic force. 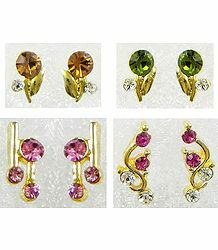 Earring designs vary vastly in each state of India. 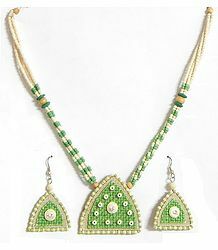 While North Indian generally wear heavy chandeliers and danglers, especially at occasions; those coming from South India wear a Jhimki, which is basically a large stud earring, attached to an umbrella-shaped dangler. These Jhimkis (also called Jhumkis in the North) come in various shapes and sizes and can contain precious and semi-precious stones and Meenakari (enamel) work on them. Necklaces as items of jewelry are popular around the world. Their existence can be traced right to the beginning of ancient civilization. Usually made of a set of metal chains, these can come in various other types, including gold, silver, copper, bronze, brass, terracotta, feathers, shells, glass, beads, pearls, Mother of Pearl, enamel, precious and semi-precious stones, wood, thread and so on. The more elaborate necklaces include the use of colorful stones, beads, gemstones and so on. Elaborate wooden necklaces can feature detailed carving and glossy polish to finish the piece. Necklaces sometimes include a decorative item hanging from them - these are referred to as pendants. A pendant which in itself a small container, it is called a locket. Choker: It is about 35-40 centimeters in length and sits snugly around the neck. Princess: A princess necklace is about 45-50 centimeters long. Matinee: This neckpiece is 56-58 centimeters long and usually comes in one single strand. Opera: This type of neck ornament is 75-90 centimeters in length. Rope: A rope necklace is any neck piece that is longer than the opera necklace. 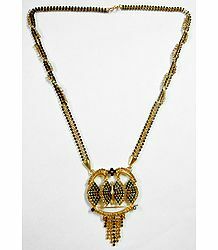 Lariat: A lariat necklace is a long version of the rope necklace and sits around the neck without the need for a clasp. Sometimes, it is long enough to be wound multiple times around the neck and can even be crossed over or looped at the ends for added effect. Religious necklaces: Having a religious value to it and/or attached with a pendant representing a religious symbol. (For example, a cross or an Om pendant). Diamond necklaces: These elaborate pieces of jewelry include several diamonds and often stand for power, love and fidelity. These are typically very highly expensive; the price range differing with respect to the design, number and size of the diamonds used and so on. Pearl necklaces: These types of necklaces are very popular among women of all ages. Elderly women especially prefer to wear these as they are classy, elegant and timeless in their grace. A uniform pearl necklace has pearls of the same size strung together in one chain. A bib necklace, on the other hand, features multiple strands of different-sized pearls. Bead necklaces: These typically have many types and colors of beads attached to them to make pretty patterns. Many of these neck pieces also include elaborately designed pendants hanging from them, so as to give them an ethnic look. Heavy Tibetan necklaces are good examples of such jewelry. Riviere necklaces: These are neck pieces that feature a single strand of gemstones of the same size and cut. Thread necklaces: As the name suggests, these neckpieces are made of several strands of thread or rope and fix around the neck with a clasp or hook. They may or may not have a pendant attached to them. Jute necklaces: These unique pieces of jewelry are handcrafted using jute. While the main necklace may be made with string or jute, the pendant is made from jute and incorporates many colors and designs. Mangalsutra: The Mangalsutra is a gold necklace, which is worn exclusively by married Indian women. It is considered a sacred ornament, as it is a mark of their marital status. Mangalsutras come in differences in length and design. While some women prefer to wear a thin gold chain attached with the symbol of matrimony, others may choose long and thick gold chains to attach the pendant to. Yet others use a chain of little black beads or karugamani, attached to one or more strands of the gold chain. North Indian and Maharashtrian mangalsutra pendants consist of a design using 2 little cups, while South Indian ones are shaped like a little altar which houses the Tulsi plant; with a small Shivalinga embedded in the center. This little locket is usually flanked on either side by manis or 'beads' made from gold. Mangalsutras pendants in Kerala resemble a little leaf, which is securely hooked onto the heavy gold chain. Bangles, also called Choodis in Hindi, are traditionally worn women in South Asia, India, Pakistan and Bangladesh. Bangles are an important part of a married woman's general attire. 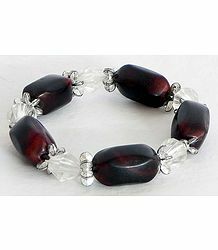 Many women wear glass bangles from the day they get married and keep them on till the last one breaks. Punjabi women wear a set of Choodas or bangles on their wedding day. Traditionally, they keep these on for at least one year after marriage. Bengali women wear a set of white and red bangles on each hand to indicate her marital status. It is considered inauspicious in certain parts of India for women to go bare armed, without wearing bangles. Even toddlers are made to wear bangles, usually made of gold or silver. In fact, in many parts of North India, a new widow breaks her glass bangles by banging them against the wall, until each one of them breaks free from her wrists. The wearing of bangles has been as ancient a culture as Mohenjo-Daro itself. Several types of bangles, made from gold, silver, copper, bronze, agate and so on, have been excavated from archaeological sites from all over India and many parts around the world. Bangles, which are usually circular in shape (some fashion bangles available today come in various shapes as well), are made of a variety of different materials such as gold, silver, platinum, glass, wood, plastic, sea shells, Lac, terracotta, Mother of Pearl and other ferrous metals. 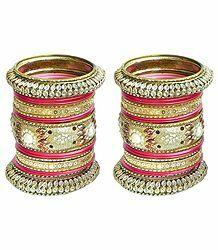 While the younger generation prefers to wear colorful bangles made of plastic or metal, married women still ornament their wrists with gold and glass bangles, especially on marriages and religious functions. Bangle designs can similarly vary from very simple to very elaborate. Handmade designs are often very intricate and include precious and semi-precious stones. These are much more expensive than the ordinary ones, depending upon the metal used to make the bangle. Some bangles also include a small bell hanging from it, in order to make a tinkling sound whenever the wearer moves her hand. While glass bangles are mostly manufactured in Firozabad in North India, the city of Hyderabad is most famous for its handmade stone-studded bangles, available at a market especially created for them, called Laad Bazaar. Armlets, also called Arm Bands or Baajubandhs, resemble large bangles and are worn snugly around the biceps of the upper arm. They are usually made of metal, precious or otherwise. Historically, these used to be worn by members of the royal family and those from the uppermost strata of society. Baajubandhs, also referred to as Vangis by women down South, is a common ornament worn by Indian women on all special occasions. Some women even wear gold arm bands on a permanent basis. The use of armlets is common in many other parts of the world. In Indonesia, these are called Kelat Bahu and are used both by men and women, usually during wedding ceremonies or at traditional community dance events. These decorative items are made of metals including silver, gold or brass. Some of them are studded with colorful stones and are further decorated with chains linked around them to further add to their beauty. Sri Lankan brides wear Vangis during their wedding ceremony to ward off evil spirits. Some men too wear this jewelry on special occasions. Performers of Indian classical dance often wear Vangis, which add to the elegance of their traditional dance costume. In the present day, these items of jewelry are also used as a fashion accessory. Like a bangle, a bracelet is also worn around the wrist. The difference is that it is usually worn as just one piece and is thinner and much less heavier than a bangle. Bracelets can be made of different materials such as gold, silver, metal, jewels, stones, rocks, beads, wood, sea shells, crystals, terracotta, pearls, plastic and so on. Bracelets are a part of ancient world culture. In fact, a bracelet was one of the most recognized symbols of ancient Egypt. In Bulgaria, there is a tradition of tying a red and white string around the wrist, in order to please the Gods to bring the spring season sooner. In Greece, a red and white string bracelet is worn to protect the wearer from the ill-effects of the Sun. Bracelets come in many colors, materials and types. The most important types of bracelets include charm bracelets, with several decorative charms hanging from them. Inflexible bracelets, which are usually made from metal, wood or plastic, are also becoming a trend among the younger generation today. Felt-covered metal strips, called slap bracelets, were at one time popular with wearers. Beaded bracelets, which are made from beads loosely connected to an elastic band, continue to be very sought-after years after their initial entry into the jewelry market. Several people prefer to wear health bracelets, made of magnets, rubies and so on, each of which they believe, influence an aspect of their health. Other alternative health bracelets include karma bracelets, ionized bracelets, iron and wood bracelets and so on. One can also get silicone sports bracelets these days, which come in a variety of bright and cheerful colors. These silicone bracelets are also commonly used as friendship bands, for charity campaigns, awareness programs and so on. Finger rings are usually available in metal; sometimes even in other material such as Mother of Pearl, wood, glass, bone, plastic and acrylic. While everyday finger rings may be made of plain gold, silver or some other metal, more elaborate rings may have detailed work on them and may also have semi-precious stones and/or gemstones such as diamonds, rubies, emeralds and so on. The custom of gifting and receiving finger rings is very ancient, dating back to almost 6,000 years. While there is no official record of the original emergence of rings as items of jewelry, this tradition has been seen in most of the countries of the world, including Egypt, Greece, Rome, and of course, in India as well. The fourth finger of the left hand, also called the ring finger, is traditionally the location to place a wedding ring. This tradition is followed almost throughout the world. It is a common belief that the finger of the left hand is directly connected to the heart by means of a vein. Rings can come in 2 varieties - adjustable and non-adjustable. The former's clasp around the finger can be tightened or loosened, as per the wearer's needs. The size of the latter, on the other hand, cannot be changed. 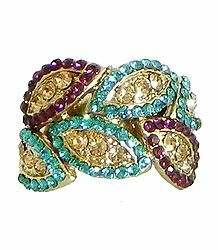 It is the current trend among women in India to wear large finger rings today, made of brightly colored stones, also available in different colors. Many of these rings, called â€œCocktail ringsâ€, cover up to half the finger. They are flamboyant and add much jazz to a saree or a party outfit. Nose rings are yet another common piece of jewelry for women in India. Indian women, especially married women, wear nose rings and studs which come in many varieties, ranging from plain gold or silver nose rings to the more elaborate and decorative ones. Most commonly, either or both sides of the nose are pierced and a nose stud is fitted in with a screw holding it in place from inside the nostril. In most parts of South India, it is compulsory for married women to pierce their nose. They are asked to wear a nose stud, usually in gold, embedded with diamonds, on one or both sides of the nose. This nose stud, called Mookutthi, is usually gifted to the girl from her parents just before her marriage. She is supposed to wear this Mookutthi for the rest of her life and never remove it. This tradition is carried on in most parts of South India even in the present day. While it is a rare sight, there are a few women that prefer to pierce the cartilage, right in the middle of the nostrils. South Indian women of yore used to insert a nose ring made of temple jewelry. This ring is referred to as a Bullaakku. These items of jewelry are traditionally worn as part of a Bharatanatyam or Kuchipudi costume. Larger nose rings, called Naths, are worn by women in North India during their wedding function. This is a compulsory part of their bridal attire. Since the Nath is too large to hold by itself, it is supported by a chain, which is secured behind the wearer's ear. Maharashtrian women too wear Naths, which is different in form. This is a nose pin, the sharp end of which is inserted into the hole. The other end is decorated with pearls and colorful stones, precious or semi-precious. They wear these Naths on all festivals and auspicious occasions. Toe rings are usually made of gold, silver, panchadhatu or any other metal. These are usually worn on the second toe of both feet. While these were traditionally supposed to be worn only by married women, it has now emerged as a style statement and even unmarried girls and women wear these to add a more ethnic look to their outfits. In fact, toe rings have now become a popular fashion accessory among women across the world. Toe rings come in many shapes and designs. Like finger rings, they too come in 2 types - adjustable and non-adjustable. 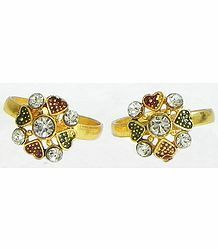 North Indian rings, called Bichiyas or Bichhwas, are typically made of silver and are decorated with intricate flower patterns embedded with enamel. Sometimes, they may have a little bell attached to them, so as to add to their beauty. Mettis or South Indian rings, on the other hand, are a set of heavy rings worn together on one toe. In Marathi, these are referred to as Jodavi; in Telugu, they are called Mettulu and Kannadigas refer to them as Kaalungura. Many women love to wear waist jewelry or kamarbands as a saree accessory. It not only further beautifies and flatters the famous Indian hourglass figure, but also helps to hold the garment in place. Kamarbands are of various types, differing in length, material and of course, price range. Most waistbands use metal such as gold, silver, panchdhatu and other metals. While some of them are snugly fitted onto the waist as in a kamarpatta, others could be slightly longer, thereby made to â€œfallâ€ at a loose angle around the waist. These may be embellished with pearls, little coins, ghunghrus (bells), beads and so on. 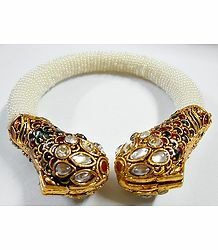 The material used to decorate kamarbands could include pearls, beads, stones, kundan, enamel and so on and so forth. It is common practice for girls and women in South India to regularly wear Odiyanams for occasions and religious functions. These odiyanams are essentially like tight waistbands and hug the waist, thereby accentuating the wearer's figure. 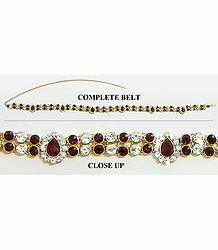 While these waist bands are generally made of gold or other metal, wealthy families often boast of Odiyanams studded with precious gemstones, including diamonds, rubies, emeralds and so on. 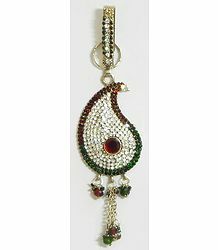 Another popular item of waist jewelry is the Chabbi Challa, an Indian ornate key chain, which is tucked into the saree, at the waist. It is made of a long hook, with a ring (for clipping keys into it) and a decorative dangler in front of it. Traditionally, the matriarch of the household kept these with her all the time and passed it on to the daughter-in-law when the time was right, thereby passing on household responsibilities to her. These items of jewelry can be made of gold, silver and other metals. Women in the present wear the Chabbi Challa as a fashion accessory. A maang tika, which is yet another compulsory item of jewelry for a bride, is worn in the central parting of her hair. It constitutes a chain with a hook at one end and an embellished dangler at the other. The hook part of the item is secured into the hair, along with a hairpin. The other falls casually on the forehead, just under the place where the hair parting starts. Maang tikas are made of gold, silver and other metals. 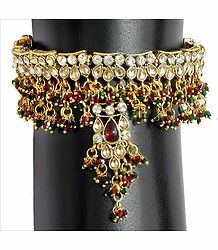 While some of them are plain and light, others can be heavily decorated with stones, beads, kundan, enamel work and so on. Hair clips and other hair accessories had been in vogue ever since the 18th Century Victorian era. Beginning as an expression of mourning, the concept of using hair accessories grew and evolved to emerge as an actual fashion statement today. While most women regularly use clips to fasten the hair, several hair brooches are painstakingly woven or braided into the hair to keep them in place. Hair clips can be made of various materials, such as wood, plastic, acrylic, shell, Mother of Pearl, Jute, colorful stones and so on. 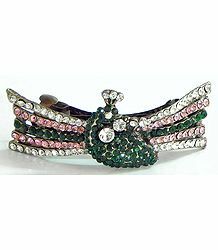 A barrette, also known as a hair-slide or clasp, is a popular hair ornament, often made of metal and/or plastic. It sometimes also includes decorated fabric. Barrettes come in different shapes and sizes, depending on how thick the wearer's hair is and in what style they would like to wear their hair. While smaller clasps are used to secure smaller portions of the hair, larger ones can be used to pull back much longer and thicker hair, to secure it in a ponytail and so on. In South India, girls and women often wear a Rakodi, a heavy circular metal plate, studded with red-and-white stones used in temple jewelry. This Rakodi is woven and braided into the hair, to rest on the back of the head, a little above the normal braid. 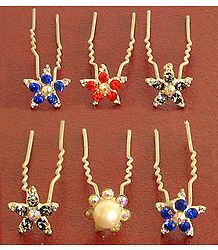 It is also common to find women all over India using decorative hair clips to secure their hair buns. These clips consist of a long, inverted U-shaped hairpin, which is inserted into the hair bun to keep it in place. The top of the U-shape is often decorated with a circular metal plate ornamented with stones, golden or silver dangling chains, pearls, beads and so on. 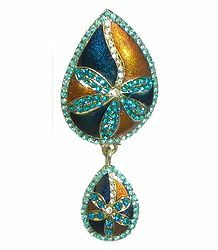 A brooch is an ornament that is attached to a garment, usually to keep it together. It is generally worn near one shoulder. Brooches can be made of gold, silver, bronze or any other metal. They are often ornamented with enamel and colorful stones, precious or semi-precious. The use of brooches is seen in early Roman, Greek and other cultures. The type of brooches worn in the past often indicated the societal status of the wearer. Those coming from royal families wore elaborate stone-studded with diamonds, rubies and other precious stones. The trend of wearing brooches had faded out in the past few years and now shows signs of coming back as a style statement, especially among the younger generation of wearers. Anklets, ankle bracelets or payals that are worn around the ankles, lend beauty to feminine feet. The culture of wearing anklets has existed in many parts of the world, such as in Egypt, South East Asia and even in some parts of Europe and the United States. Anklets can be made of silver, gold, beads and colorful stones, as part of casual fashion jewelry. Women of South India regularly wear anklets. In fact, anklets are an important part of Tamil culture. The 3rd Century epic, Silappadikaaram, revolves around the story of a stolen anklet and how a man is killed as he is suspected to have stolen it. This story relates in great detail the beauty of the stolen anklet. Many women hailing from Kerala wear gold or golden anklets, which they refer to as Paadasarams. This tradition is not generally followed by Tamil women, as they associate gold with Goddess Lakshmi, the Goddess of Wealth. Hence, they usually refrain from wearing gold on the feet. Women from Rajasthan in North India wear the heaviest type of silver anklets. They not only wear this as a part of beautification, but also to display their bravery as a tribe as compared to rival tribes. These ageless pieces of jewelry are still in vogue and non-Rajasthani women often wear these as a style statement. Anklets are also available in lesser precious metals, leather, plastic, nylon and so on. Metal anklets can come in 2 types - flexible and inflexible. Very often, sonorous bells are attached to the chain to make a tinkling noise as the wearer walks around. Inflexible ones are thick and are given the shape of a flat metal sheet. Much bigger and thicker anklets are worn by Indian dancers, both classical and folk performers. These Salangais or Ghungrus are tied tightly around the ankles and are secured by buckles and/or ropes, to make sure that they do not fall off while the dancer is performing. While Indian women usually wear anklets on both ankles, Western women usually wear only one, either on the left or right ankle. It is now a fairly recent trend for Indian brides to invest in elaborate bridal jewelry sets. 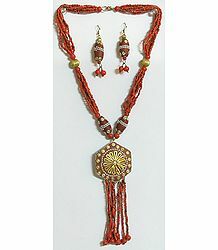 These sets include the basic bridal jewelry and come in a stunning variety of colors, designs and patterns. 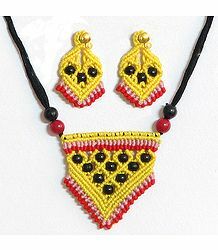 A typical bridal set includes one or twin necklace sets, along with matching earrings and maang tika. Other more detailed sets include a nath and a ring bracelet. The advantage of owning an entire bridal jewelry set is that the wearer gets to match her jewelry with her saree or bridal joda. The other plus is that she needs to make only one purchase for her entire outfit. 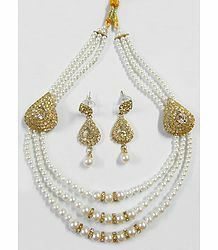 Bridal jewelry sets can be made of various metals, including gold, silver and others. Some brides prefer gold-plated or one-gram-gold sets. While some prefer to purchase readymade sets, many brides like to get their jewelry customized and made-to-order. 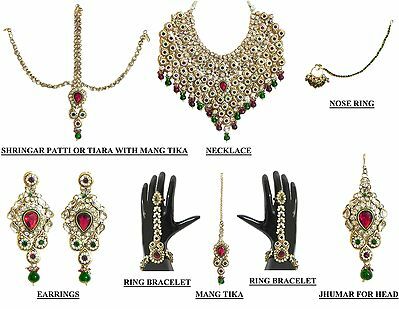 Depending upon the wearer's preferences, bridal jewelry sets can be embellished with kundan, enamel, pearls, beads, precious and semi-precious stones. One must-have item in a bridal trousseau is a jewelry box, which she can use to store all her jewelry and even take along with her while traveling. Jewelry boxes typically contain several little compartments, each for storing one particular type of ornament. These boxes come in various shapes, sizes and patterns; depending upon how much jewelry she would like to keep in them. 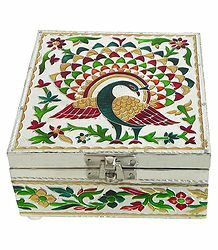 The more elaborate jewelry boxes are made with porcelain, marble, glass, Papier Mache and wood. Some include meenakari (enamel) work and even replicas of madhubani paintings in the front, so as to give them a very ethnic, typically Indian look. 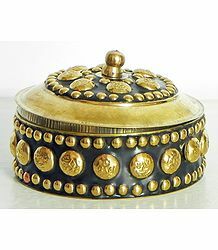 Bangle boxes enable the wearer to safely store her bangles, especially fragile material such as glass bangles. These little boxes, usually made of hardboard, plastic, acrylic or wood, are extremely portable and so, can be used during travel. Bangle stands can be made of the same material. These items can accommodate several dozens of bangles, depending on their size and pattern. Since they are quite light, they can either be placed upon a dresser or can be stored inside a cupboard for further security.